Find the path of a given resource URL by searching through directories in konlpy.data.path. If the given resource is not found, raise a LookupError, whose message gives a pointer to the installation instructions for konlpy.download(). resource_url (str) – The URL of the resource to search for. URLs are posix-style relative path names, such as corpora/kolaw. In particular, directory names should always be separated by the forward slash character (i.e., ‘/’), which will be automatically converted to a platform-appropriate path separator by KoNLPy. Load a given resource from the KoNLPy data package. If no format is specified, load() will attempt to determine a format based on the resource name’s file extension. If that fails, load() will raise a ValueError exception. resource_url (str) – A URL specifying where the resource should be loaded from. format – Format type of resource. list konlpy default data directory. A list of directories where the KoNLPy data package might reside. These directories will be checked in order when looking for a resource. Note that this allows users to substitute their own versions of resources. A path pointer that identifies a file by an absolute path. An abstract base class for path pointers. One subclass exists: 1. FileSystemPathPointer: Identifies a file by an absolute path. read method reads all files included in items attr and save it into corpus dictionary. A class used to access the KoNLPy data server, which can be used to download packages. The KoNLPy data downloader. 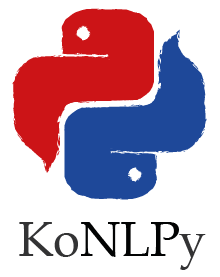 With this module you can download corpora, models and other data packages that can be used with KoNLPy. Returns the directory to which packages will be downloaded by default. This value can be overriden using the constructor, or on a case-by-case basis using the download_dir argument when calling download(). On Windows, the default download directory is PYTHONHOME/lib/konlpy, where PYTHONHOME is the directory containing Python e.g., C:\Python27. On all other platforms, the default directory is the first of the following which exists or which can be created with write permission: /usr/share/konlpy_data, /usr/local/share/konlpy_data, /usr/lib/konlpy_data, /usr/local/lib/konlpy_data, ~/konlpy_data. Initializes the Java virtual machine (JVM). jvmpath – The path of the JVM. If left empty, inferred by jpype.getDefaultJVMPath(). max_heap_size – Maximum memory usage limitation (Megabyte). Default is 1024 (1GB). If you set this value too small, you may got out of memory. We recommend that you set it 1024 ~ 2048 or more at least. However, if this value is too large, you may see inefficient memory usage. PropagatingThread is just a fancy wrapper for Thread to manage exceptions. self.exception: Exception defined in higher-level. Overrided method to enable Unicode pretty print. Converts a unicode character to hex. Find concordances of a phrase in a text. The farmost left numbers are indices, that indicate the location of the phrase in the text (by means of tokens). The following string, is part of the text surrounding the phrase for the given index. phrase – Phrase to search in the document. show – If True, shows locations of the phrase on the console. data – A list of list. str: string without at marks. Converts a hex character to unicode. Text file loader. To read a file, use ``read_txt()``instead. Partitions a list to several parts using indices. list – The target list. indices – Indices to partition the target list. stream – Option to stream to a particular destination. Can be either sys.stdout (default) or sys.stderr. See #179 for details. Replaces some ambiguous punctuation marks to simpler ones.